I did something yesterday that I haven’t done in over ten years. When I was unpacking boxes in the garage, I came across my yearbook from my Junior Year of High School, and I sat down and read it. 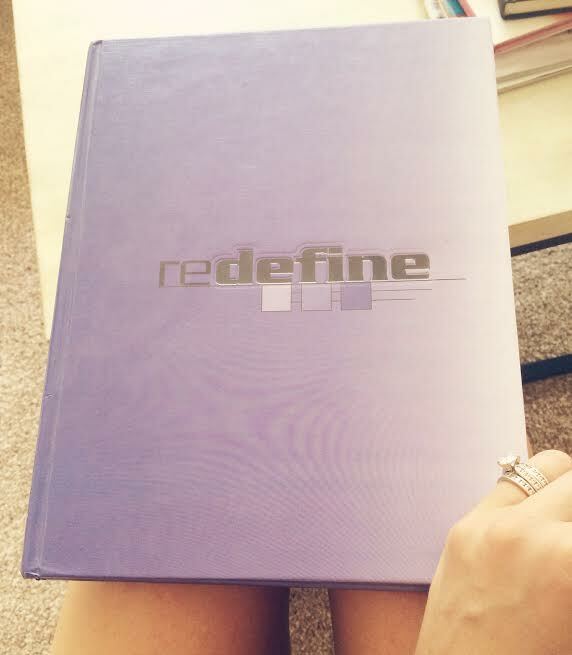 This was the year I moved from Stillwater, Oklahoma to a suburb of Chicago, so the title of the yearbook, “redefine” is of great significance looking back. When I opened the cover I had a pit in my stomach, but when I started reading the notes, something odd happened. I felt love emanating off the pages. In the scribbled messages (even from the people I thought were “too cool”) are genuine well-wishes. Genuine love and decency and friendship. I think I’m only able to see it all these years later because I didn’t really like myself back then so I didn’t expect anyone else to. I have only a handful of people I’m still in touch with from my last two years of high school. For a long time now I’ve thought I went to high school with mostly a bunch of jerks. Now that I’m looking at it through clearer eyes, I think I might have been the jerk this whole time. You know how people say, well I wasn’t always perfect “but I wouldn’t change a thing!” I think those people are liars. Who wouldn’t love to go back and handle a situation with more grace and dignity? Who wouldn’t love to go back and speak up? I understand seeing the silver lining in the decisions that brought you to your current situation, but what does it say about you that you wouldn’t change a thing if you COULD…I just can’t relate to that. And I’m proud to say that I’ve realized how stuck up and self absorbed and closed-off I was, because it means I’ve changed. I’ve grown. I’m a better version of myself. Oprah always says “when we know better, we do better.” I don’t believe in making yourself sick dwelling on where you went wrong (there are prescriptions to cure that.) But I do believe in acknowledging the times in your life you wouldn’t be proud to see again. I sometimes think that’s all Hell really is. It’s just a big screen repeating a loop of actual things you did that you wish you could take back, played in front of everyone you don’t want to disappoint. We are all works in progress. There’s nothing wrong with admitting you wish you could change something in your life. The shame comes from not having the courage to acknowledge it. I now realize that high school was a crazy time for all of us. Also, why did we all think we were so fat? Why? We were so thin! My favorite post ever!! I love you just the way you are!!! !